U.S. Vice President Mike Pence and his wife Karen wave as they landed at Tel Aviv airport Sunday, Jan. 21, 2018. Pence will pay a three day visit to Israel. U.S. Vice President Mike Pence said Monday it was an honor "to be in Israel's capital, Jerusalem," highlighting a U.S. decision to recognize the city as he met with Israeli Prime Minister Benjamin Netanyahu. President Donald Trump parted from decades of U.S. policy by saying Jerusalem is Israel's capital and setting in motion the process of moving the U.S. embassy there from Tel Aviv. "In making his historic announcement on December 6, President Trump did so convinced that by recognizing Israel's capital of Jerusalem that we would create an opportunity to move on in good faith negotiations between Israel and the Palestinian Authority on issues that can be discussed and President Trump truly believes can be resolved," Pence said during his latest stop on a four-day visit to the Middle East. Netanyahu thanked Trump and Pence for what he called the "historic statement" and declared the U.S.-Israel relationship has "never been stronger." In addition to a series of bilateral talks, Pence is also giving an address Monday to the Knesset, Israel's lawmaking body. Senior White House officials said the vice president would be discussing the U.S.-Israeli relationship, ways to counter Iranian influence in the region, and strategy on the Syrian conflict. In the Knesset speech, the officials said Pence planned to say there is an open window for both Israelis and Palestinians to get to work and make necessary sacrifices toward a long-sought peace agreement. Trump's decision brought sharp criticism from Palestinian leaders, including President Mahmoud Abbas who said the United States could no longer play a role in the peace process. 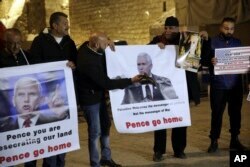 Palestinians hold posters of U.S. President Mike Pence as they protest his visit to Israel in Bethlehem, West Bank, Sunday, Jan. 21, 2018. Arab members of parliament have said they will boycott Pence's speech. Netanyahu criticized that decision during a Cabinet meeting Sunday while calling Pence a "great and true friend of Israel." Before traveling to Israel, Pence was in Jordan where King Abdullah expressed concern about the Jerusalem decision and urged the United States to "rebuild trust and confidence" in the search for a two-state solution. Jordan's King Abdullah and wife Queen Rania are seen during their meeting with U.S. Vice President Mike Pence and wife Karen Pence (not pictured) at the Royal Palace in Amman, Jordan, Jan. 21, 2018. King Abdullah said the only solution to the Israeli-Palestinian conflict is the two-state solution long sought by the international community, and that East Jerusalem must be the capital of a future Palestinian state. Pence said the two countries had agreed to disagree on the Jerusalem issue. "Friends occasionally have disagreements, and we agreed to disagree on recognizing Jerusalem. We agreed all parties need to come to the table. I hope I impressed on him our earnest desire to restart the peace process," Pence told reporters after the meeting. Before Jordan, Pence visited Cairo, where he pledged the U.S. would continue to support Egypt in its battle against terrorism. Pence also met with U.S. troops in the region before flying to Israel.